Dale Elphinstone, the founder and Executive Chairman of the Elphinstone Group, was born in 1951 and raised on a mixed dairy farm at Highclere, an inland community on the North West Coast of Tasmania, and attended the Ridgley Area School. Commencing work as an apprentice diesel mechanic with William Adams in 1966, Dale completed his qualification in 1970. 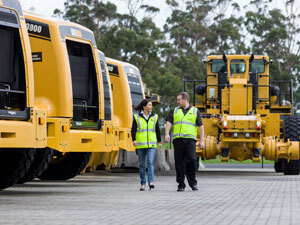 After working as a resident serviceman at the Savage River mine on Tasmania’s west coast, and later on King Island during the development and expansion of the King Island Scheelite Mine, Dale worked as a field serviceman for Finning Tractor, the Caterpillar dealer in British Columbia, Canada before returning to continue his career with William Adams in Australia. Dale left William Adams in 1975 to start his own business but returned in 1987 to acquire William Adams, achieving his life-long ambition to become a Caterpillar Dealer.